Join us from the 18-25 of April 2015 for a week's cycling through some of southern Spain's most picturesque countryside alongside a man synonymous with the world of professional cycling, Paul Kimmage. Join us from the 18 - 25 April 2015 for a week's cycling through some of southern Spain's most alluring countryside alongside a man synonymous with the world of professional cycling, Paul Kimmage. Paul Kimmage’s life has been shaped by a love for cycling. He was born in 1962, the year his father, Christy, won the National Road Race Championship and spent his boyhood dreaming of emulating his dad. In 1981, he became the youngest Irishman ever to win the Road Race Championship and should have won the 1983 Tour of Britain but for a crash on the penultimate stage. In 1984, he won his second Road Race Championship and represented Ireland at the Los at the Los Angeles Olympics. A year later, he won a stage of the Tour of Normandy and the Tour of Poland and finished sixth in the World Amateur Road Race Championships in Italy. 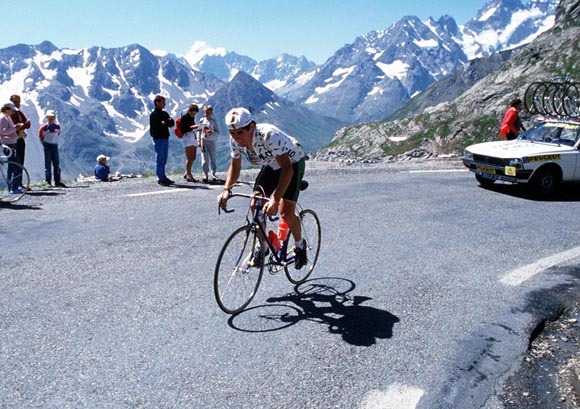 In 1986, he turned professional with the French team, RMO and completed his first Tour de France. In 1987, he finished 8th in the Nissan Classic and joined the Irish team of Martin Earley and Sean Kelly at the World Road Race Championships in Austria won by Stephen Roche. In 1989, he raced the Giro D’Italia and Tour de France with Roche on the Fagor team and then retired from the sport to begin a new career as a journalist with The Sunday Tribune. A former ‘Sportswriter of the Year’ in Ireland, he was short-listed five times for ‘Sportswriter of the Year’ in Britain and is a five- time winner of ‘Sports Interviewer of the Year’ at the British Sports Journalists’ Association awards. He has written for the Sunday Tribune, the Sunday Independent, the Sunday Times, the Observer and the Daily Mail. He has also presented a sports magazine programme for Setanta TV and was an analyst for Al Jazeera TV during 2012 London Olympics. His first book, Rough Ride, is widely acknowledged to be the most honest account of life in the professional ranks and won the 1990 William Hill Sports Book of the Year Award. In 2000, he was shortlisted for the same award with ‘Full Time: The Secret life of Tony Cascarino.’ In 2011, his fourth book, ‘Engage: The Fall and Rise of Matt Hampson’, was the British Sports Book of the Year and the William Hill Irish Sports Book of the Year. Join us for a week on the road with Paul and share his memories of the good, the bad and the ugly over dinner and a glass of wine. We will begin our rides each day from the quintessential Andalusian village of Velez de Benaudalla. The village is based on the gentle southern slopes of the Sierra Nevada mountains in an area known as the Alpujarras. The Alpujarras is listed by UNESCO as a Biosphere Reserve because of its unique mini-ecology. Its terraced farmlands are constantly watered by the melting snow from above, constituting a high-altitude oasis of greenery which stands in dramatic contrast to the arid foothills below. Velez de Benaudalla with the Sierra Nevada in the background. The southern side of the Sierra Nevada is a largely unexplored cycling destination, but it boasts some of the best roads for cycling in Spain. In comparison to the Canary Islands or Mallorca, the area has much broader network of traffic free country roads with a lot more climbs to choose from. Couple this with some of the most visually stunning scenery and you have got an ideal destination for cycling. Along the way we'll take in some of the culinary delights the area has to offer, including; a visit to the local olive oil mill, a tapas tour of Granada, a visit to Trevelez, famous for it´s Serrano Jamon and a visit to a small local wine producer for a tasting. Saturday: Arrival, build bikes/adjust rental bikes, short spin to test the bikes, dinner and then relax after a long day of travelling . Sunday: Light spin of 3 hours to open the legs. Evening meal with Paul. Monday: Medium spin, 3 to 4 hours. Afternoon and evening free to explore the village and relax. Tuesday: Long day in the saddle, 5 hours, with a possible trip to Spain's highest village, Trevelez. Wednesday: Optional rest day or a light early morning coffee spin to the beach. In the evening we'll arrange a trip to the city of Granada and a prearranged Tapas Tour of some of the city's best bars. Thursday: Medium day of 3 to 4 hours cycling in some spectacular scenery with a visit to a local wine producer atop of the Sierra de la Contraviesa mountain range. Friday: Will be a long day in the saddle of 4 to 5 hours. Pack up the bikes. Inclusive 3 course evening meal in a local restaurant followed by a Q&A session with Paul. The price for the week is only €575 based on two sharing a twin room. 5 days guided cycling accompanied by Paul on 4 days. We´re based on the Costa Tropical, which is blessed with 320 sunny days a year making it a perfect location for your winter cycling training camp. The Costa Tropical takes its name from the sub-tropical climate which enables the cultivation of exotic crops such as mangoes, bananas and citrus. With warm winters and long hot summers, the average year round temperature is 20c. The Costa Tropical is the perfect place to start of your winter training regime and get those important early season base miles in. We´re situated in the famous Alpujarras region on the warmer southern slopes of the Sierra Nevada mountain range, with easy access to the warm coastal routes of the Costa Tropical. The area boasts lots of traffic free, quiet, country roads, making it a perfect destination for your cycling holiday/training camp. It´s an area used in the by the likes of Ireland´s Dan Martin and Poland´s Michal Kwiatkowski for their early season spring training camps. Please click here for further information on our cycling holidays and training camps.